(Sugar Land, Texas, Aug. 9, 2016) - Former Sugar Land Skeeters pitcher, Chris Smith, 35 was called up by the Oakland A’s on August 7, 2016 to face the Chicago Cubs. Smith pitched an inning in his outing, giving up no runs on one hit with a strikeout. The California native has four years of MLB experience between the Red Sox, Brewers and A’s organization where he has accumulated a record of 1-0 with a 5.11 ERA over 68.2 IP with 53 strikeouts and 27 walks. 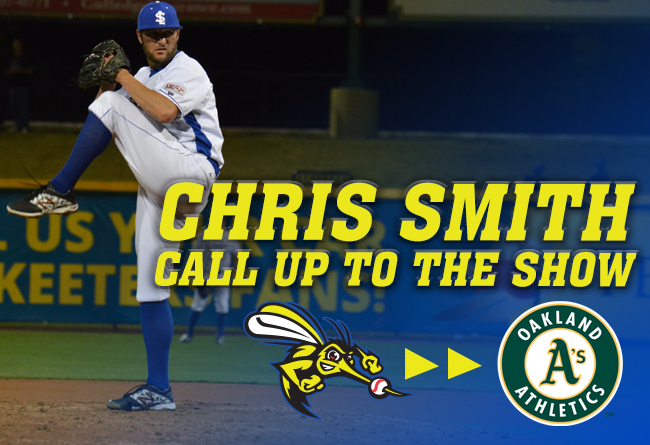 In 2014, Smith was lights out for the Skeeters in his eight starts, going a perfect 6-0 with a 2.15 ERA in 50.1 IP with 55 strikeouts and 10 walks. Smith is the third former Skeeter to join a major league roster in 2016 along with Scott Kazmir of the Los Angeles Dodgers and Hunter Cervenka of the Miami Marlins. Kazmir, 32 is a three-time all-star who was the AL strikeout leader in 2007. In 12 seasons, the right-hander has served stints with the Rays, Angels, Indians, A’s, Astros and Dodgers organization. Kazmir has won 107 games while posting a lifetime ERA of 4.00 with 1,600 strikeouts. The Houston native signed with the Sugar Land Skeeters in 2012 and started 14 games for the club, finishing the season at 3-6 with a 5.34 ERA. Cervenka, 26 currently pitches for the Miami Marlins after recently being traded from the Atlanta Braves at the MLB Trade Deadline. The southpaw made his MLB debut on April 13, 2016 against the Washington Nationals. From that point on, Cervenka went 10 straight innings without giving up a run. Cervenka has appeared in relief in 52 games this season between the Braves and Marlins and has posted a record of 1-0 with a 3.86 ERA with 36 strikeouts and 23 walks. The Texas native signed with the Skeeters in 2015 where he pitched in eight games without allowing a run.